Good morning Alicia with some inspiration today. I love finding new uses for older dies. I recently ordered Frantic Stamper Large Bob's Old Truck and as I was designing my card, I remembered one of the very first dies I purchased from Dies R Us was this Die-Versions Sweet Spots A Little Bit Country die. I have previously paired it with a boot image in a card for my niece which was precious. Here I have made a great little card with a die cut scene. Frantic Stamper Large Bob's Old Truck die is so user friendly, since the truck is one die and the accessories are another. 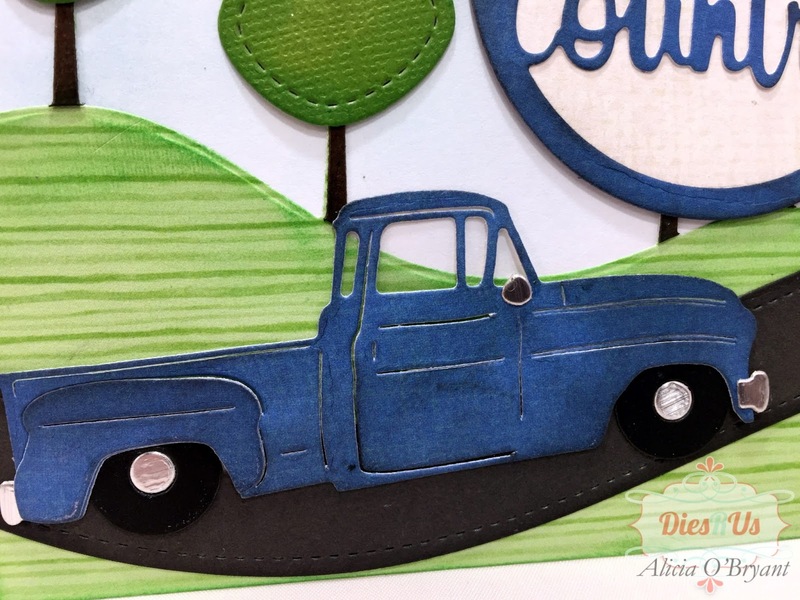 I was able to cut the truck just once in my blue paper. I cut the bumper in the same blue paper. I then cut the accessories twice once in black and once in metallic silver, the accessories are tiny so this made for very little wasted paper. After using a precision glue pen to adhere the accessories and a thin piece of acetate for the window, I distressed the old truck up with black chalking ink. I cut the Lawn Fawn Stitched Tree Border twice as I did the last time I used it. Once in the green "grass" and once in brown to give the trees "trunks". One of the Lawn Fawn Stitched Tree Border and the Lawn Fawn Road Border actually follow the same curvature for a perfect tree lined road but I used the other tree border to provide more of a background of grass and trees. I am making a note of that fact to use in the future. 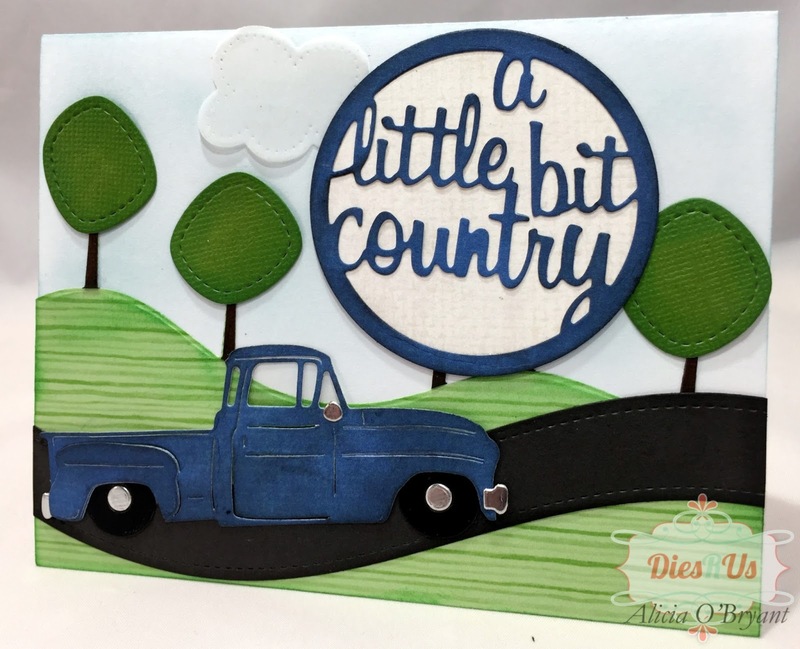 I am loving all of the texture and the cuteness of your card. Perfect masculine card. This is super cute Alicia! Love how you brought all those dies together for this perfect scene! How cool is this Alicia! Great use of those dies! What a fabulous guys card! Well done! I love this country scene, Alicia! The color combination is awesome!